Want to learn more about how your investments in technology can pay off? New research from Gartner takes you through the Hype Cycle for Consumer Engagement with Healthcare and Wellness to guide impactful investments in new technology. Technology is the new front door to healthcare, conveniently connecting consumers with providers. Seamless access to care is now an expectation of modern patients, leaving health systems to figure out the best ways to provide a centralized view into their organization, physicians, and services. 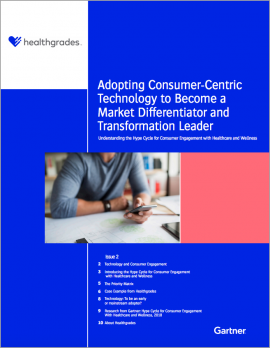 In this new white paper, you’ll learn how to identify technology solutions that help address consumer needs -- such as patient self-scheduling -- to make the right investments and set your healthcare organization up as a market leader. Discover this important research and more. Download your copy today! Do you have valuable content that you'd like to get in front of decision makers at hospitals, health systems, and physician groups? Contact us about advertising and sponsorship opportunities.